Implant crowns and bridges are single or multiple tooth replacement therapies that is used to replace missing teeth. Each crown or bridge is made out of porcelain; similar to the restorations you would have placed on a prepared, natural tooth. The coloration and design of the porcelain restorations are carefully handcrafted to blend in with your natural smile. If you have just one missing tooth, an implant crown can replace it and look as if you never had a missing tooth to begin with. The titanium root is placed into the socket area of the missing tooth and new bone forms around it for stability. After healing has taken place, the porcelain crown is permanently cemented to the implant. These crowns are made to be strong and secure enough to function just as well as your natural teeth. 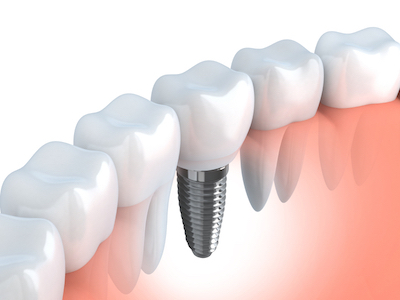 Implant crowns are a wonderful choice over other types of treatments. Typically a traditional bridge is used to replace single missing teeth, but traditional bridges require the adjacent teeth to be ground down and have a dental crown placed on them. By choosing an individual implant crown, you can replace your missing tooth without having to compromise the health of your other teeth. In the past, if you needed 2, 3, or 4 teeth replaced at once, you usually had to have a partial denture made. A partial denture is a removable appliance made of metal or acrylic with false teeth bonded onto the base. They can be difficult to become accustomed to when you’re eating or talking. Partial dentures can also be uncomfortable if they do not fit correctly. A dental implant bridge is the superior way to replace several missing teeth at once, avoiding cumbersome partials. With implant bridges, two implant roots are used to support the restoration; one on either end of the open space. These implants support a dental bridge the same way a traditional bridge is supported, but without compromising the structure of natural teeth on either side. Bridges appear as several porcelain crowns fused together, supported on each end with false crowns between them. All implant bridges are permanently fixed to the roots, keeping your restoration in place.